The guided-missile destroyer that suffered a collision with a merchant ship in June off Japan will be transported to Huntington Ingalls Industries’ Mississippi shipyard to be repaired, the Navy told USNI News on Wednesday. USS Fitzgerald (DDG-62) will be transported by a heavy-lift carrier from its current location at a dry dock in Yokosuka, Japan to Ingalls Shipbuilding in Pascagoula, Miss. for repairs. 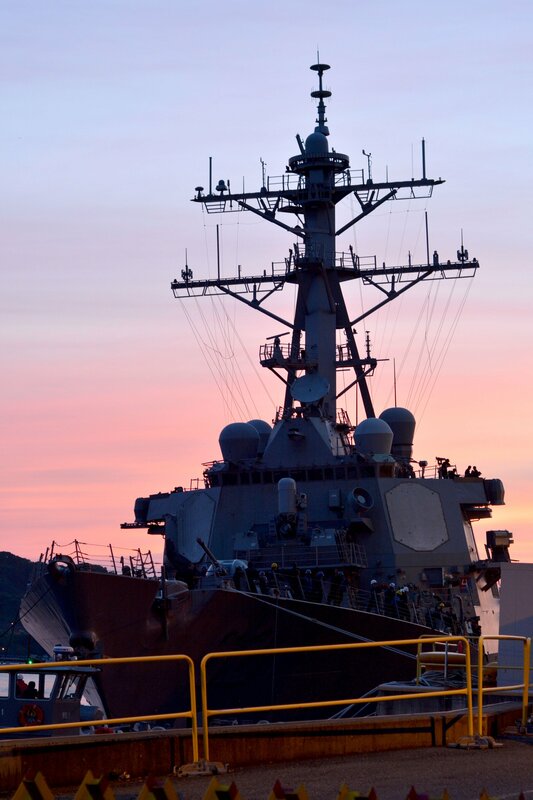 A contract to reconstitute the destroyer will be completed by the end of the current fiscal year but the scope of the work has yet to be determined, the service said. Earlier this month, the Navy issued a solicitation to contract a heavy lift ship to move Fitzgerald to the U.S. for repairs to repair the damage from the impact and subsequent flooding that resulted in the death of seven sailors. The ship could leave Yokosuka as early as next month. The repair bill for Fitzgerald will easily top the $250 million cost to reconstitute USS Cole (DDG-67), which was hit by a terrorist bomb while docked in Yemen in 2000. Cole was also transported to Ingalls by a heavy lift transport for the repair work. “The Cole was largely engineering, and it’s electronics that gets you,” retired Navy captain and naval analyst Chris Carlson told USNI News in July. The cost to bring Fitzgerald back could easily top $500 million. As to the location of the repairs, the Navy determined that only an Arleigh Burke-class destroyer shipbuilder could make the fixes. “The Navy chose this course of action following a review of the capabilities and workload of new construction and repair shipyards. Given the complexity of the work and the significant unknowns of the restoration, the Navy determined that only an Arleigh Burke-class shipbuilder could perform the effort,” Naval Sea Systems Command said in a statement. The Navy’s other guided-missile destroyer yard, General Dynamics Bath Iron Works in Maine, is currently behind schedule in delivering its current crop of destroyers and has been struggling with workforce capacity issues. While the ship will be restored in Mississippi, it’s unclear how many upgrades the Navy will for the destroyer. The Navy could elect to upgrade the ship to a Baseline 9 standard that replaces legacy computers with modern servers and allows the ship a greater ballistic missile defense capability as well as the ability to simultaneously interdict aircraft and cruise missile threats. The overhaul costs about $270 million, according to estimates obtained by USNI News. A request for comment from USNI News if the Navy would elect to upgrade Fitzgerald to Baseline 9 was not immediately returned. The following is the complete statement from Naval Sea Systems Command. The Navy intends to award a contract initiating the restoration of USS Fitzgerald (DDG 62) at Huntington Ingalls Industries (HII) in Pascagoula, Mississippi, before the end of the fiscal year. The start date, scope, cost and the time required to fully restore the ship have not yet been determined. The Navy chose this course of action following a review of the capabilities and workload of new construction and repair shipyards. Given the complexity of the work and the significant unknowns of the restoration, the Navy determined that only an Arleigh Burke-class shipbuilder could perform the effort. Only HII has the available capacity to restore USS Fitzgerald to full operational status in the shortest period of time with minimal disruption to ongoing repair and new construction work. 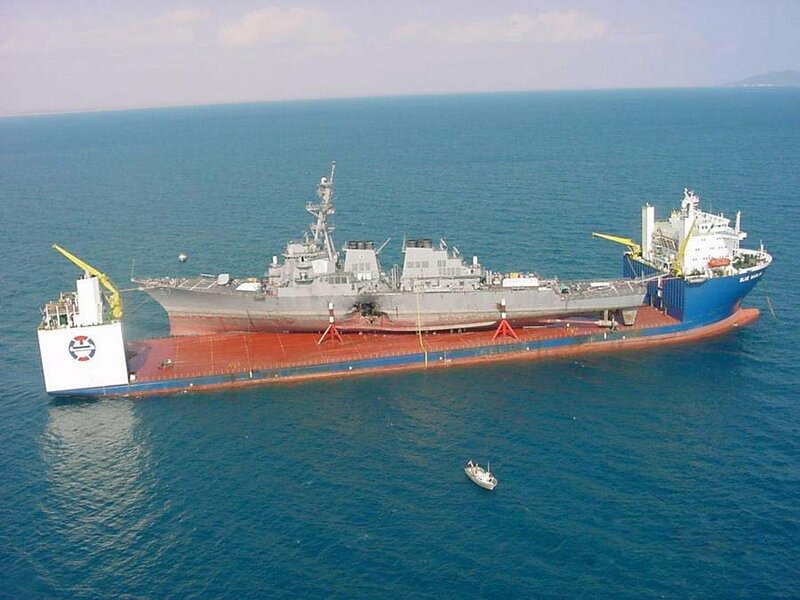 Additionally, the Navy is currently evaluating proposals to award a contract for the heavy lift transport of USS Fitzgerald from SRF-JRMC Yokosuka to the continental United States. USS Fitzgerald was involved in a collision with the Philippine-flagged merchant vessel ACX Crystal on June 17. The ship suffered damage on her starboard side above and below the waterline. Compartments that were affected include two berthing spaces, a radio room, a machinery space, and various lockers, passageways, and access trunks. In addition to the restoration effort, the Navy intends to incorporate previously planned modernization efforts into the availability that were to have taken place at SRF-JRMC Yokosuka in 2019.